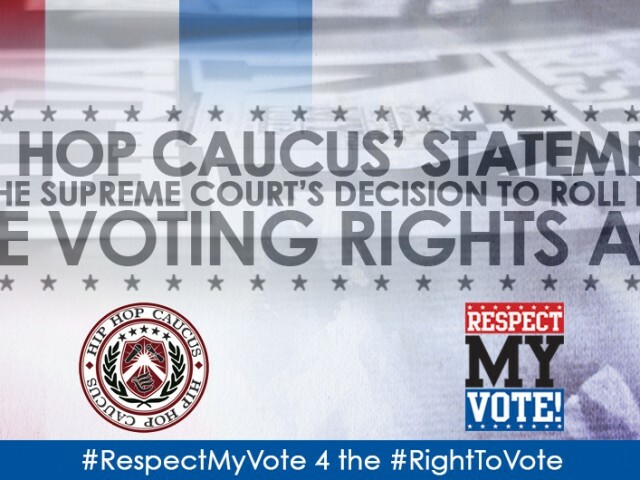 HIP HOP CAUCUS WILL WORK TO ENSURE ALL VOTERS ARE PROTECTED FROM DISCRIMINATION UNDER VOTING RIGHTS ACT - RESPECT MY VOTE! “The Supreme Court’s out-of-touch decision in Shelby County v. Holder ignores the fact that Congress has clear constitutional authority to protect voters’ rights from racial discrimination. The evidence is overwhelming that racial discrimination in the voting process continues today in states and jurisdictions around the country. Chief Justice John Roberts and Justices Scalia, Kennedy, Thomas, and Alito, have leveled a major setback to our most fundamental right, the right to vote. The Voting Rights Act is what people fought and died for half a century ago, and it is unfathomable that in 2013, just seven years after Congress re-authorized VRA, five Supreme Court justices would undo this landmark law that has served as an essential protector of our democracy, and continues to be necessary today. The Hip Hop Caucus, through its ‘Respect My Vote!’ campaign which has registered tens of thousands of young voters of color over the past three election cycles, will be working with partners across the country to see that Congress enacts a new statute which reactivates the essential preclearence provisions of the VRA that the Supreme Court effectively gutted. About the Hip Hop Caucus (www.hiphopcaucus.org): Formed in 2004, the Hip Hop Caucus (HHC) is a non-profit, non-partisan organization that leverages Hip Hop culture to encourage young people to participate in the democratic process. Through a collaborative leadership network, HHC addresses core issues affecting underserved communities. HHC programs and campaigns support solution-driven community organizing led by today’s young leaders.